Late Saturday nights I set my alarm for early morning Sunday power wake-ups. I hate these wake-ups and my alarm, but if I don't Sunday nights turn me into an insomniac and by Monday I am a working woman train wreck with the mere weekend bragging rights of watching lots of documentaries and MMA fighting (I know, I know, not very lady like). This past Sunday made for a particularly easy rise in anticipation of putting these overnight rolls into the oven and getting cream cheese from the store while they baked. It comes down to this: my quest for all thing poppy seed almond will never be exhausted! While I admit this passion has been put in the back burner these past few years with almond croissants, my heart will always be strung out on poppy seeds. 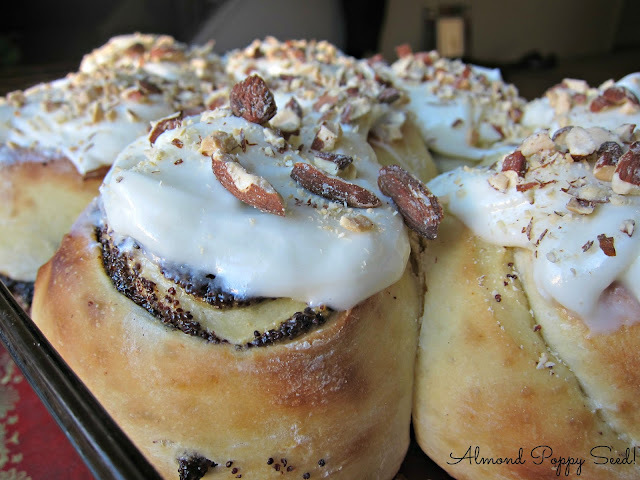 I love poppy seed almond muffins so much, why not make them in cinnamon roll form? 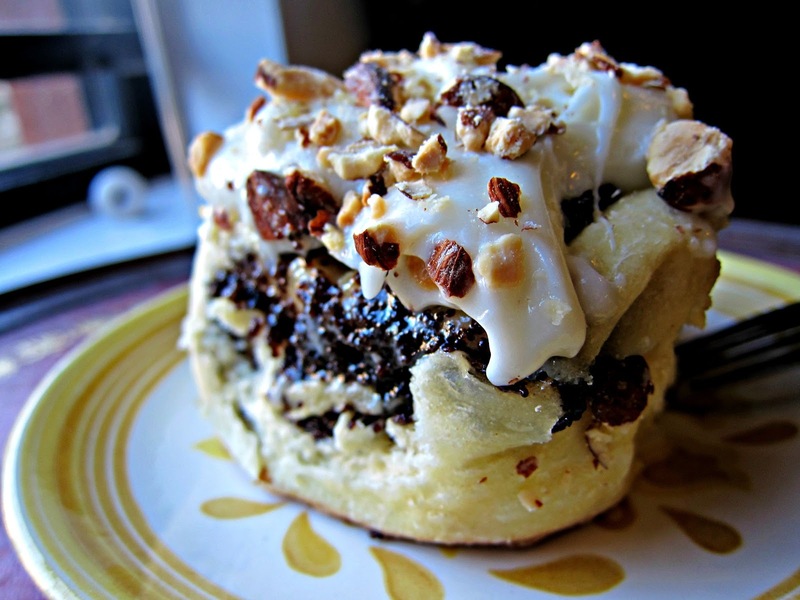 A lush poppy seed swirl, almond laced cream cheese frosting, salted roasted almonds on top? This is what Saturday night dreams are made of! Dreams are also made of cream cheese frosting. 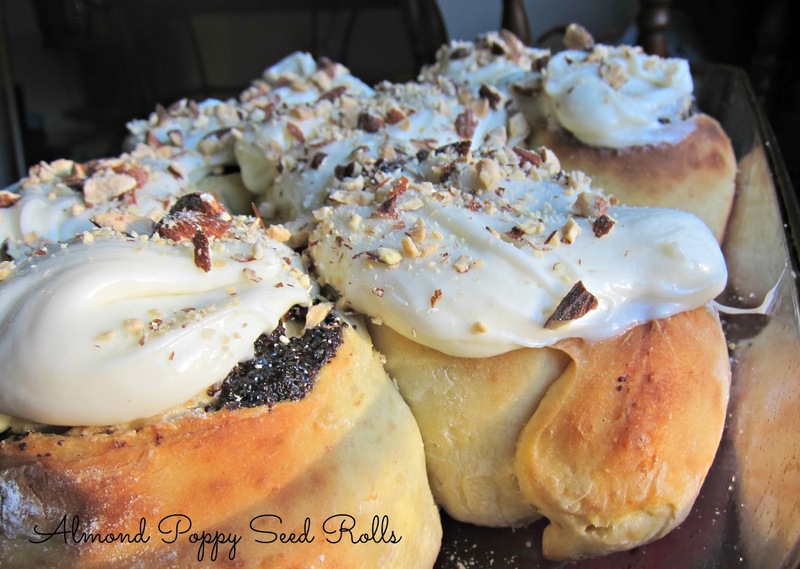 And by the way, there is nothing cozier than rich cream cheese frosting on a warm cinnamon (poppy seed) roll. Also, can cinnamon rolls and their deviations (poppy seed almond rolls, for example) be the new cupcakes/doughnuts? I'd like to see all sorts of crazy cinnamon roll spin offs happening. Because, there is nothing better than eating a gigantic roll in the morning (or afternoon). In a large bowl, combine 2 cups of flour, yeast, sugar and salt. Mix well, then add eggs and milk/butter mixture. Beat well. Add remaining flour, 1/2 cup at a time, stirring well after each addition. When dough has just pulled together, turn it on a lightly floured surface and knead until smooth. Add more flour if needed, but this dough should be very sticky! Cover the dough and let rest for 10 minutes. Roll out dough in to a 9x12 inch" rectangle. Spread the dough evenly with poppy seeds. Roll up dough from the long end, then cut into 12 equal size roles (ok, I made mine way bigger!) in a 9x12" baking pan. Cover and put in the fridge over night. The next morning remove the rolls and let sit on the counter for about 20 minutes to take the chill off. Preheat oven to 375 degrees F.
Bake for about 20 minutes or until browned. Meanwhile, in a small food processor or a mixing bowl, blend together topping ingredients except the almonds. When rolls are ready, let rest about 10 minutes then frost and sprinkles with chopped almonds. Oh how I wish I had seen this on the weekend! It has been raining bucket loads and these would have been so perfect to munch on with some hot tea. Bookmarked for next weekend!! We've recently launched the site RecipesUS.com, where users can search through hundreds of thousands of recipes from American food sites and blogs. We noticed that you have a lot of delicious recipes on your blog and we would like to suggest you have a look at our site: http://www.recipesus.com/. If you want to add your food blog to the list and have your recipes indexed on RecipesUS.com, all you have to do is follow these instructions: http://www.recipesus.com/add-your-food-blog. what a crazy brilliant idea! i love this so much! mmmm poppy seed swirl! While I was reading your recipe I had visions of you in a long white dress dancing over the rising dough of these rolls. Just woke up and this definitely is cheering me up. These look incredible, Anna! Won't you FEED ME? Pretty please? Drool...lick screen! These are gorgeous Anna..and very creative. Poppy seed swirls rock! Anna - let me know how it goes! hope you have a chilly weekend :-P not really! Senka - Thanks for the heads up. Natassia - Poppy seed swirls should be in muffins, too? tasteofbeirut - haha I do have a long white dress...we could make this dream come true. Cathy - come visit your old stompin' ground and hell yes! Trevor - Haha, well there always best when fresh on the first day, right? @Darjeeling - awesome, wow, flattered! find any good ones in SF (besides Tartine :p).